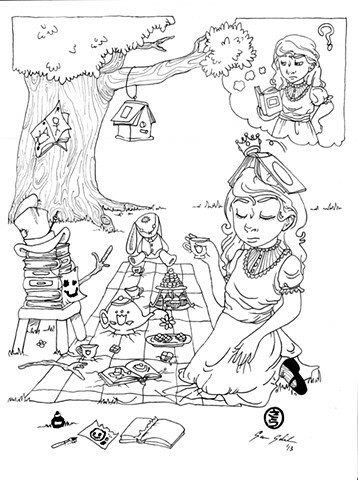 This illustration is for chapter 1 when Alice ponders, "what is the use of a book with no pictures?" The idea was to come up with as many odd and maybe obvious ways to use a book in another way. This was also my homage to the infamous mad tea party scene, hence the "book doll" with a ratty top hat and the stuffed rabbit. Probably my most simple illustration for the project thus far but I was dead set on this idea and there's only so much flourish you can give it before you lose details.